With the sun blazing down and summer almost here there's no better way to beat the heat other than with fresh and frothy homemade smoothies, shakes and fruit juices. ...... humble butter milk we love you too! 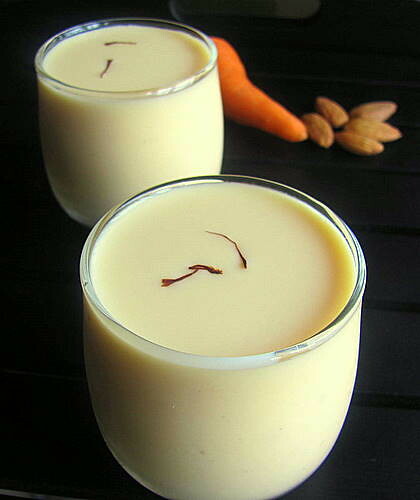 Ground almonds cooked in milk flavoured with cardamom along with a touch of saffron, the 'carroty' taste complimenting the nutty flavour, this kheer serves best any time of the day, and is for sure a perfect nourishing summer drink which you can prepare in less than half an hour! 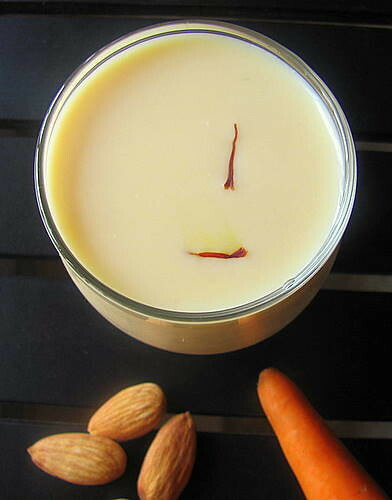 *Fat free milk is preferred as whole milk suppresses the natural taste of almonds. Kheer made with light milk is more comforting too. 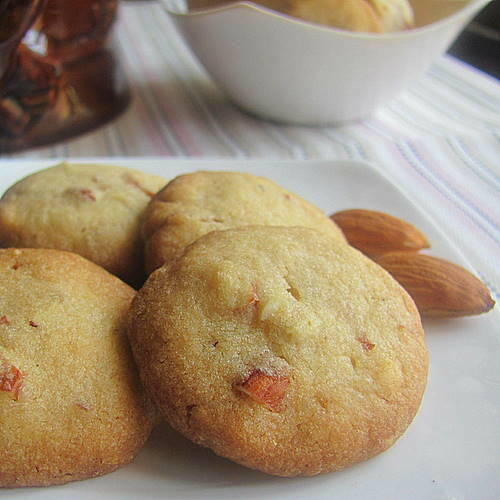 Soak almonds in hot water ; just enough to keep them immersed for 30 minutes. Peel off skin one by one and grind to a smoothest paste adding a little milk. Peel the skin of the carrot, cut into chunks and pressure cook. Cool and grind to a smooth paste. If you have the cooked water, do not worry! Stir in both the pastes into that until blended. If there isn't any left over water, just blend the pastes in half cup of milk reserved from the one litre. Add sugar to the milk and bring to boil. Reduce the flame and blend in the pastes stirring continuously. Simmer for 5 minutes to let the nuts cook. If you feel the kheer too thick, stir along 1/2 a cup of milk or so to bring to the right consistency. 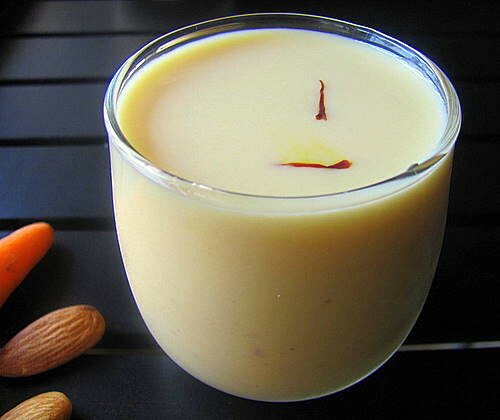 Switch off the flame, stir in cardamom and serve hot topped with saffron strands. The kheer turns thicker while cooling. I love it chilled, though! It was so soothing and refreshing that I ended up having a whole chilled jug thoroughout the day, skipping meals ;). Electrolux and Kelly Ripa are proud to support the Ovarian Cancer Research Fund whose mission is to fund research to find a method of early detection and ultimately a cure for Ovarian Cancer. Electrolux has committed to donate $ 750,000 to this worthy cause. Right now on Kelly Confidential, you can select a perfect tea party outfit for Kelly's Tea Party for a Cause. When you do Electrolux will donate $1 to the Ovarian Cancer Research Fund. Foodbuzz and Electrolux are partnering to host a Top 9 Tea Party Takeover on Friday, March 25th. In a Top 9 take over, Foodbuzz has asked their Featured Publishers to construct a post around a theme and then, for one day only, all Top 9 posts reflect that theme! For this they want us to create the perfect tea party recipe.Foodbuzz will also donate $50 to the Ovarian Cancer Research Fund for everyday tea party recipe created by a Featured Publisher before March 23rd! 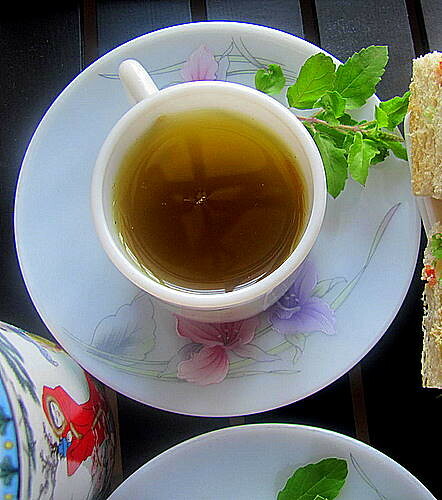 Why Tofu Sandwiches with Green Tea? 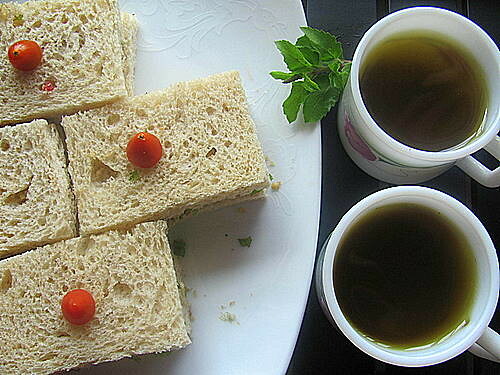 Tofu- Eating tofu regularly can almost halve a woman's chances of developing ovarian cancer according to the researchers. More here.. Vegetables are rich in bio active compounds with potential cancer-preventive actions and increased consumption reduces the risk of ovarian cancer. 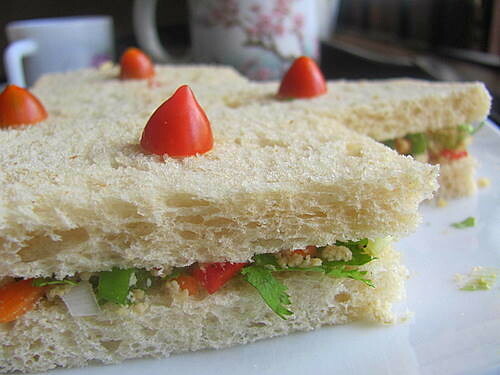 Cherry tomatoes, bell pepper, onions, onion greens, cilantro, baby carrots and cucumber are used to make this sandwich. Learn more here..
Green Tulsi Tea- Tulsi (Holy Basil), recognised as India's most sacred herbs originated in the country many thousands of years ago, is known for its rich antioxidant and adaptogenic properties. Also referred to as Holy Basil Tea, this herbal brew's adaptogens guard against and deal with physical, chemical, environmental and emotional factors that produce high levels of stress that compromise physical and mental health. Read more about its benefits here..
Wash and crumble tofu gently with you finger tips in a bowl and mix in the minced vegetables along with the soy sauce, lemon juice, pepper powder and salt, gently until combined. Trim the edges of the bread slices and cut into rectangles or squares. 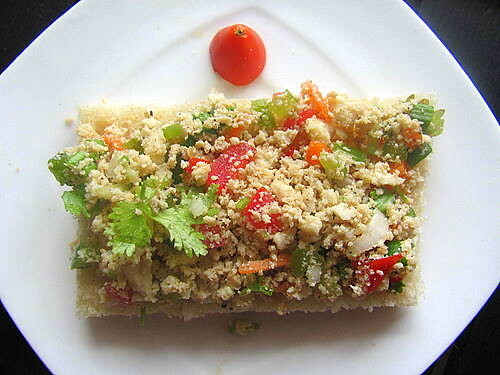 Place the tofu vegetable mix as a thick layer over the slice, close with another, hold using a toothpick inserted, topped with a halved cherry tomato. Handful of Tulsi (holy basil) leaves - I always have the plant in my back yard and plucked fresh green leaves. Wash the tulsi leaves and boil with orange peel in water for a minute. Let it stand for 5 minutes. Strain, stir in honey and it is ready to be served hot. Can be served cold as well. As a matter of fact, I hate cats! Yes, I do! But surprisingly this kitten has become my pet ever since he popped in one fine day at amma's house. He was fed fresh milk, fish, meat, bread and rice whenever he was hungry and he chased and pounced on the mice in return.. He welcomes me with a soft meaow during my occasional visits to amma's and I take care of him until I leave.. 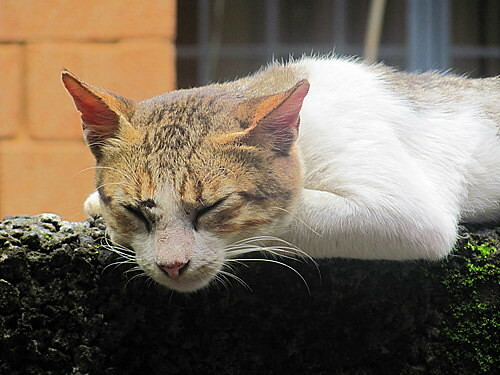 This picture was taken on a sunny afternoon while enjoying his peaceful nap after one of his sumptuous 'fish n rice' lunches. 1. Wash and slice the mushrooms thin and long. 2. 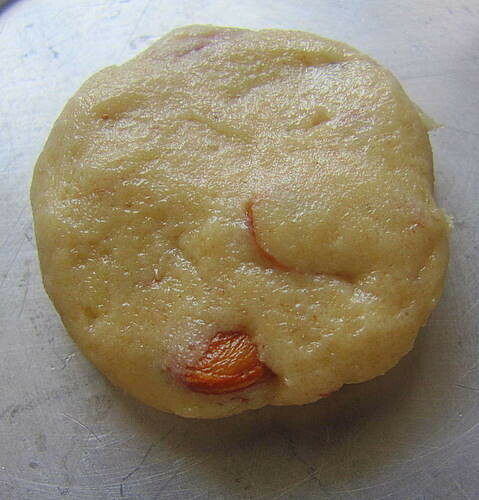 Prepare the batter with the ingredients listed, thick, which resembles dosa/idly batter, in a wide vessel. 3. Dump the sliced mushrooms into the batter and mix well. Drop small bite sized pieces into hot oil and deep fry until browned, as batches. Keep aside. 4. Now for the mixing up part; in a broad and wide wok, heat 2 tbsp oil and sauté the sliced ginger-garlic,(broken red chillies if you substitute red chilly powder), onion and capsicum in that order and sauté for a couple of minute. The onions and bell pepper should retain its crispiness and do not let them turn brown.They need to be just translucent. 5. Now add the red chilly powder(if you omit red chilly bits), soy and chilly sauces along with white pepper powder in high flame and mix continuously for a few seconds. I took off the dish from the stove at this stage after adding the fried mushrooms and mixing it up well together allowing the sauces and spices to seep in and did not add any water as I needed the dry version. 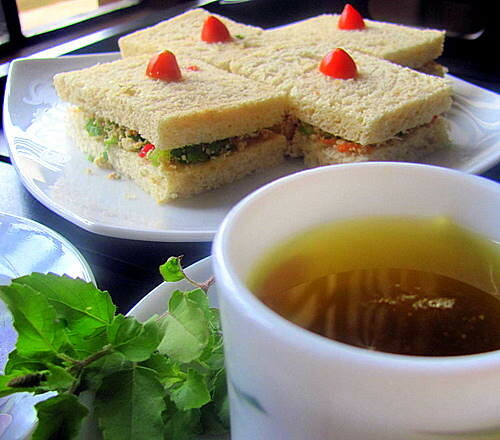 I served hot garnished with scallions (spring onion greens). 6. 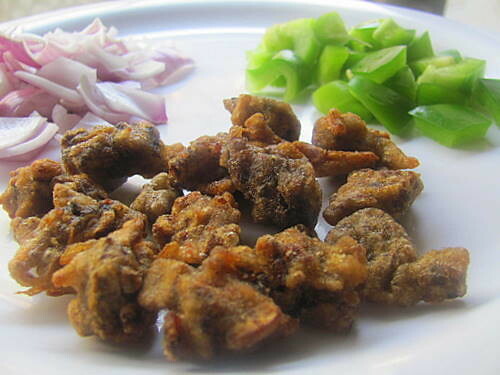 Add ½ cup of water at the end of stage 5 above along with the fried and cooled mushroom chunks. 7. Sauté again for 3-4 minutes to absorb excess water of any and switch off fire when it is semi dry/ saucy consistency has reached. Let the pieces be 'a li'l crisp' and not soggy at this stage.Garnish with scallions and serve hot with Indochinese fried rice or noodles. If you like the gravy version of the same, add some more water, say 1/2 - 3/4 cup more and make it thick by adding a tspful cornflour while you bring it to boil. 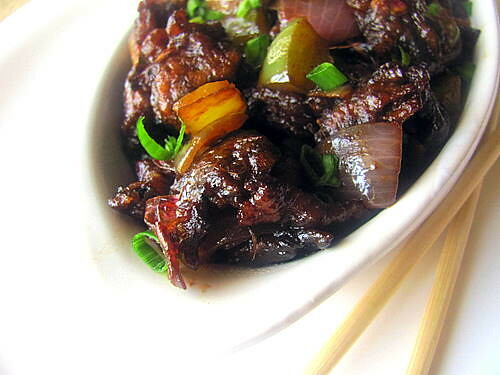 Simmer for a few minutes and serve hot. Again, see to it that you add a little extra amounts of the sauces and spices as the water dilutes the final taste of the gravy version. I had mailed them but no response until now nor they removed my picture. 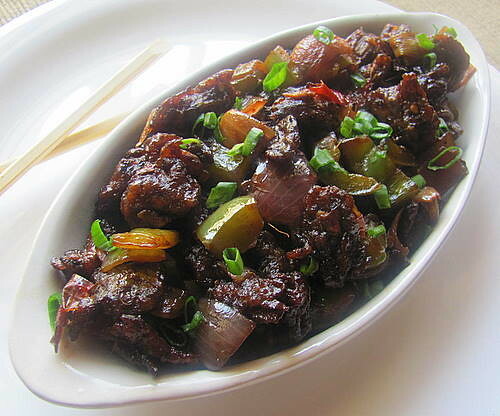 Well, these guys, Andhra Corner @ Onetech (pls dont click on the link giving them more hits, the screen shot is just below) has also lifted the same picture and named Gobi Manchurian...(thankfully not fooling their readers with the image part but with editing the recipe a bit). I have yet to write to them but have no hope that they would remove the picture and do some justice. 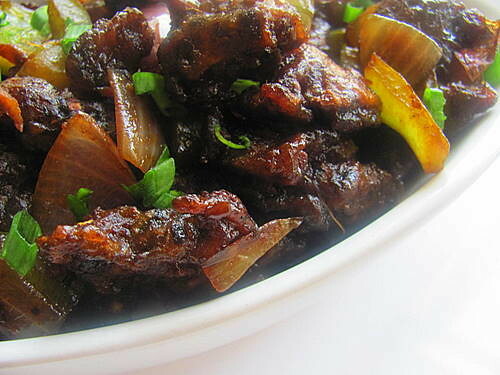 Coming back to the recipe of Mushroom Munchurian, this seems to be complicated, but believe me, it's simple. Even if the measurements of sauces or ingredients get altered a little, the final outcome will always be great! 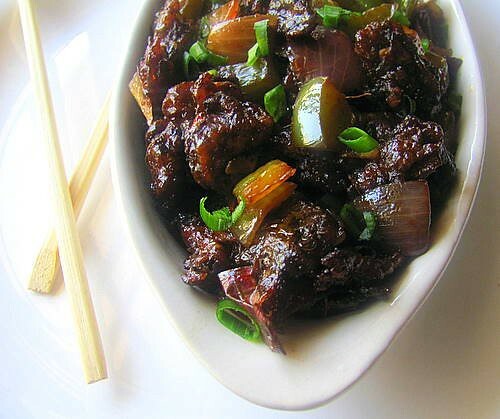 I love this dry version the best as it has the exact 'restaurant style' taste of crispy mushrooms, with the added traditional blackish hue, soaked in the flavour of the rich dark soy! 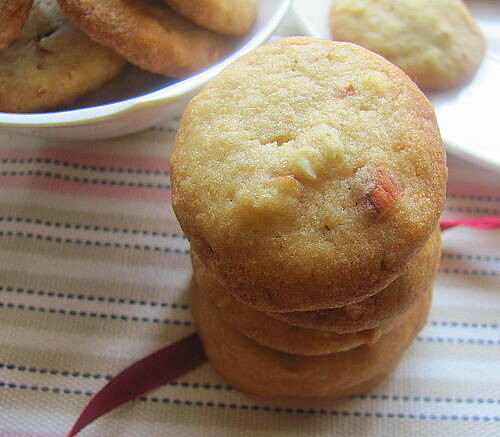 S imple, crunchy, flavorful and addictively delicious is an understatement for these cookies you see here. Tight hugs to Sweet Punch team for the wonderful choice! 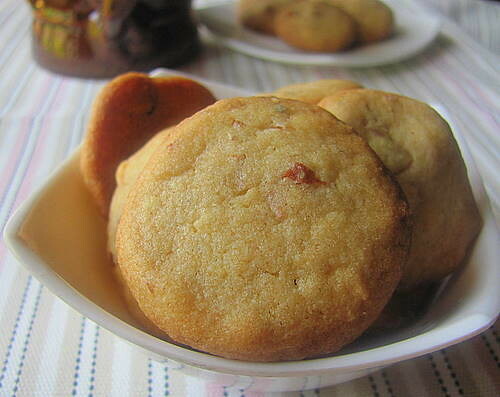 Take my words, bake them and you will never regret munching on this very much 'Indianish' Cookies! In a bowl, mix the dry ingredients; flour, sugar, salt, sliced almonds and cardamom powder well. 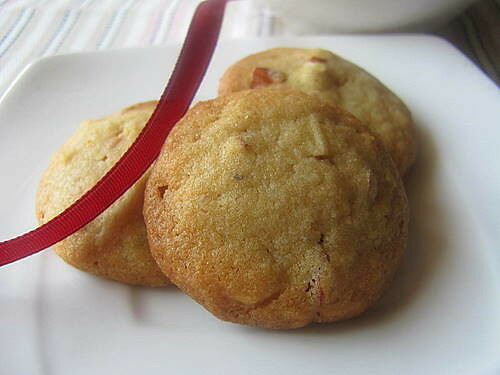 Bake the cookies for about 18 minutes or until cookies are lightly golden brown. After they are done remove the cookie sheet from the oven. Let the cookies cool down for two to three minutes before taking them off the cookie sheet. 1. No added milk.The homemade butter was soft enough and dint call for the milk. On the contrary the dough was sticky and I had to knead in 2 tbsps of wheat flour to make it right. 3. The oven temp was set to 210 C (a high temp for anyone but not to my old fashioned conv one :)) and the baking time needed was 15-18 minutes, the edges have browned but the cookies tasted great that way.The original recipe says 180 C for 18 min. So the baking time varies according to the temp and type of oven you use. I still remember the day, brother and me waiting impatiently for amma who finally entered the house with a white bundle, carefully wrapped. 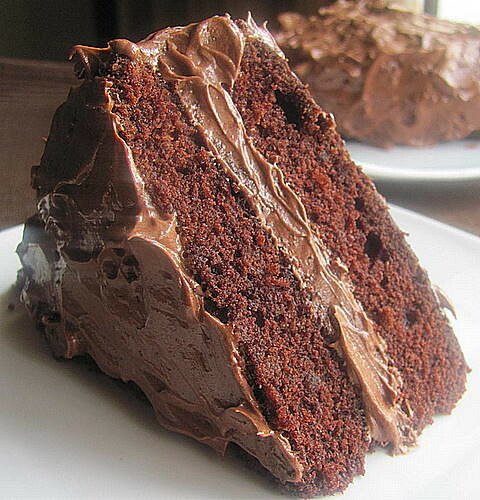 Devil's Food Cake for the Chocoholics! It was half past midnight. V and me were getting back home chitchatting happily about the eventful Loyolites' meet. Suddenly I came across a pretty looking box sitting at the back seat of my car.I reached out for my mobile, searched the name Shobhna and queried, "hey, is this box yours? shall I just come across and give it back to you?" "Don't do it Bharathy, it's for you. Open and enjoy," came the reply. "I thought she left it behind while getting dropped" I explained to my better half. Shobhna, one of my dearest pals among V's friends' wives, had come down with Sudhakar, her lively n cheerful hubby for the Loyolites' meet from Kodai. Back home, I couldn't wait to open the cute box. Yaaoo!! 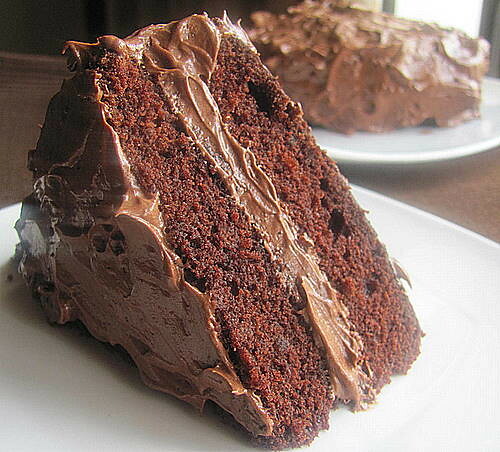 The Rich Moist Devil's Own Chocolate Cake!! I squealed in delight! Believe me or not, I found licking my fingers clean after finishing half of it within a minute with a heavy burp, that too after the grand buffet dinner at the college meet. It was the yummilicious Devil's cake I'd ever had! I called up Shobhana the next day for the recipe which she explained. The ingredients and the method sounded almost exactly like Nigella's Granma's Devil's Food Cake, except for the slight difference in measurements, addition of coffee powder and the frosting. I baked the cake thrice ever since and it came out perfectly delicious every time I did! 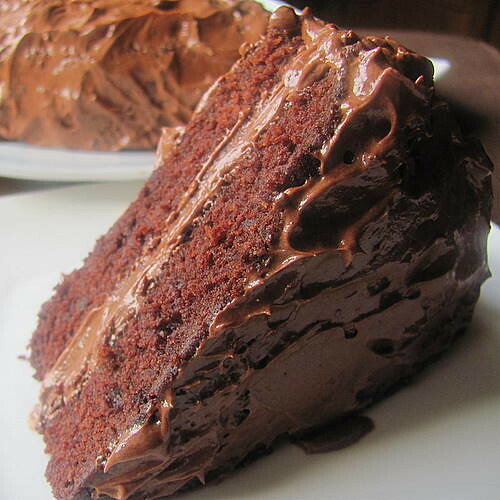 Try it if you are a chocoholic; you will never fail and ultimately will be baking it again and again! Remember, you need 11 major ingredients to make the cake. 7. Cool the pans on a wire rack.Run a knife around the edges to loosen from the pans and turn layers out on the rack, placing one upside down and the other right side up. Cream butter and sift in sugar and cocoa powder. Add vanilla and mix well until soft and creamy. You may add 3-4 tsps of milk little by little if you find the frosting too thick. Be careful or it may turn out to be runny. * I never measure when it comes to frosting and the measurements above are approximate. I start with 100 gms/ half cup of butter, add 1/4-1/2 cup of sugar, 2 tbsps cocoa and proceed doing taste tests in between increasing the quantity, slowly. I avoid the addition of vanilla since contented with the 'chocolatey home made butter' flavored frosting. 1. Brush any loose crumbs from the layers and place one upside down on a serving plate. Spread with some of the frosting. Centre the remaining layer, right side up over the top. 2. Use remaining frosting to coat top and sides making decorative swirls around sides and over the top. 3. 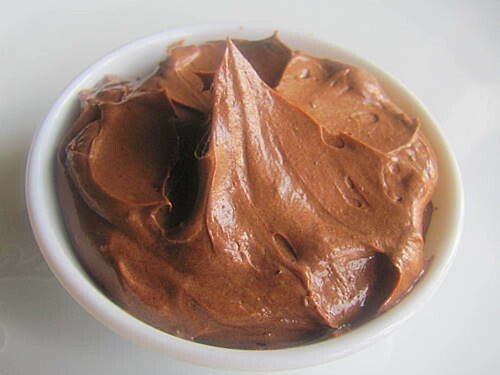 Chill to set frosting but return to room temperature before serving.